Autumn has set in, it’s not long till the clocks go back and the blackberries (such as they were) are over. 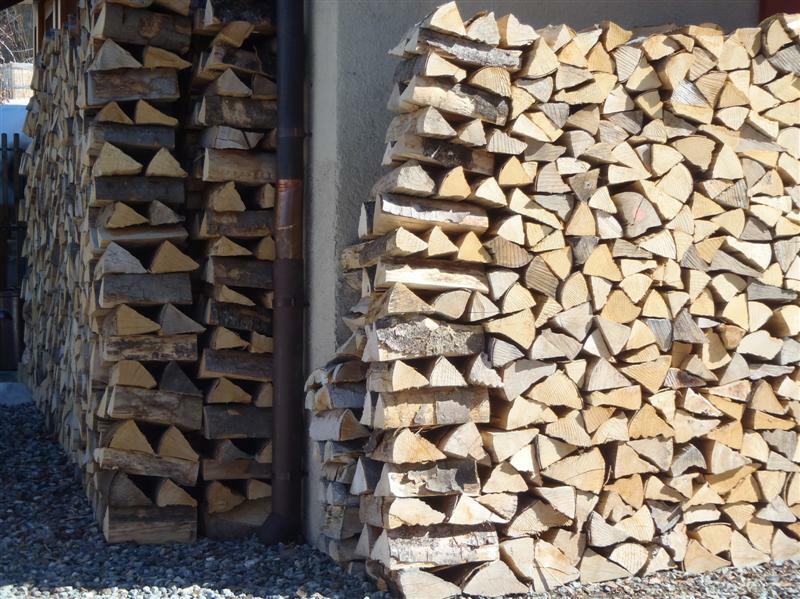 It’s the time of year when I light a fire in the evening – and that means it’s also time to get my wood pile in order. 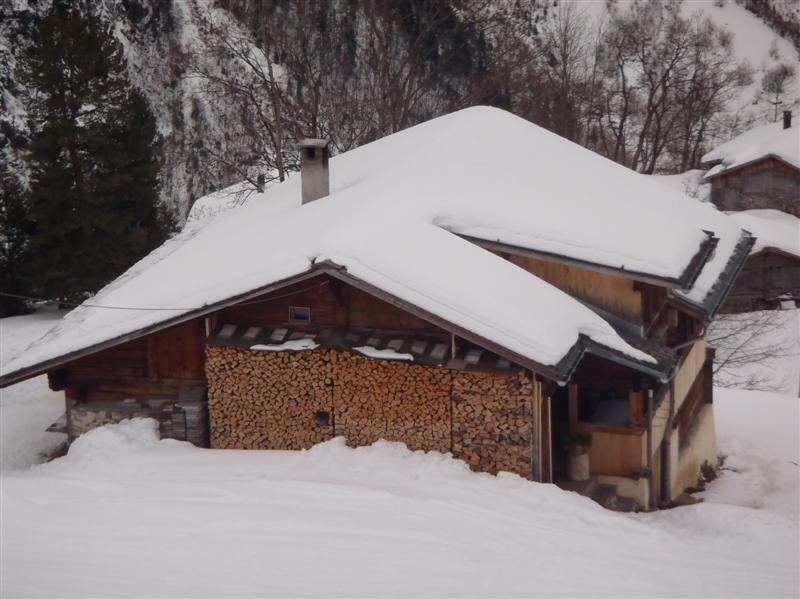 It’ll be no surprise to skiers that the countries that lead the way in the art of building a successful wood pile are the mountainous ones. 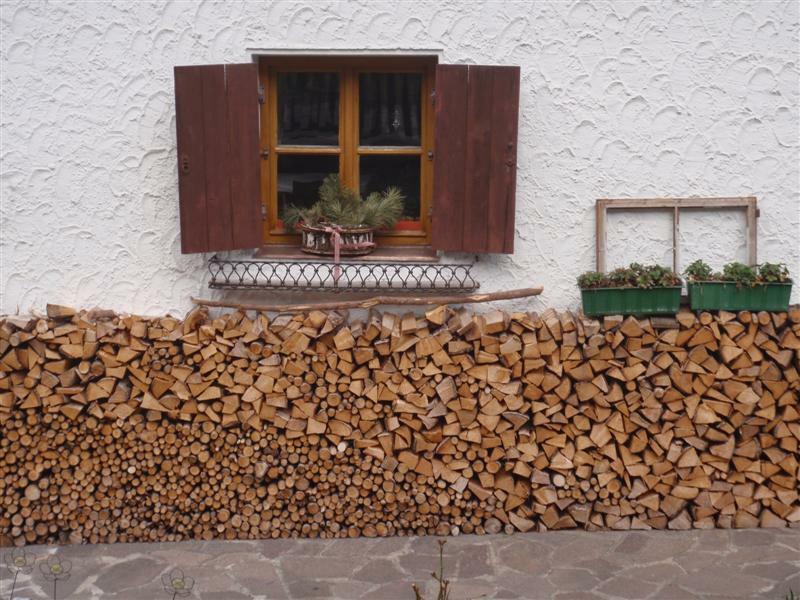 From the villages of the Valais to the towns of the Tyrol to the dwellings of the Dolomites, householders across the Alps are masters in stacking them neat, stable, dry and, in some cases, high. 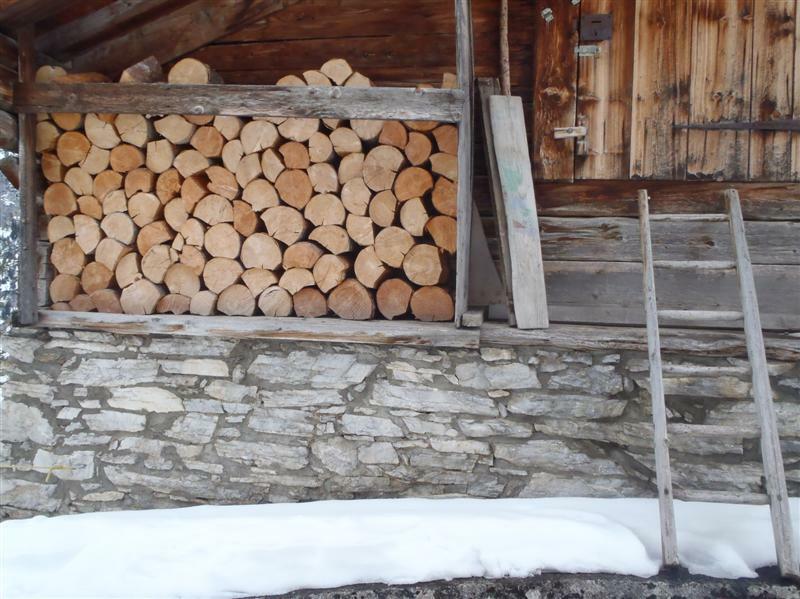 I have been photographing these labours-of-logs (sorry…) during my travels in the mountains. 1. To make a good pile, logs need to be cut to the same length. 2. Larger logs are split to similar widths. 3. Smaller unsplit logs – almost kindling-sized – are stacked all together, sometimes in their own section of the pile. 4. A good stacking place must be found. 5. Sometimes this place will have support at one or both ends, but often it doesn’t. 6. 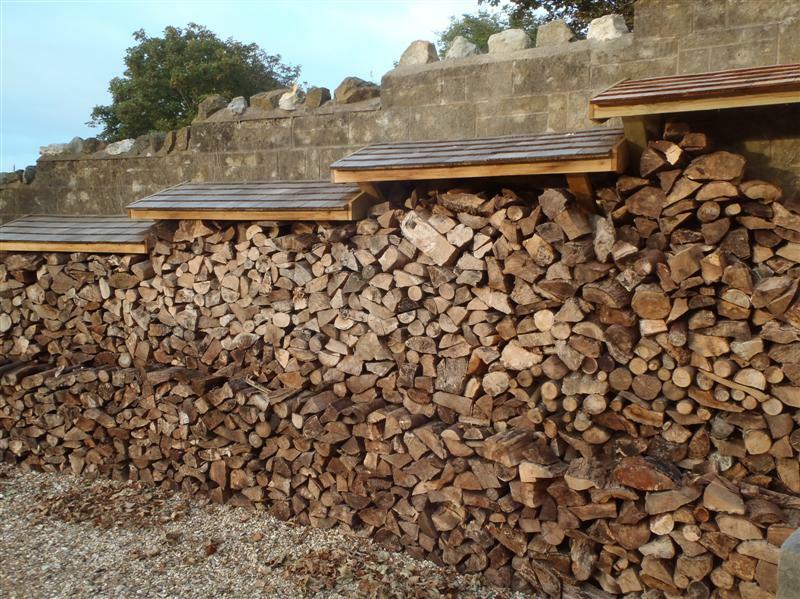 To build an ‘end’, some sort of criss-cross system is used, such as two logs one way, then two at 90 degrees, on top; repeat up to desired height. 7. 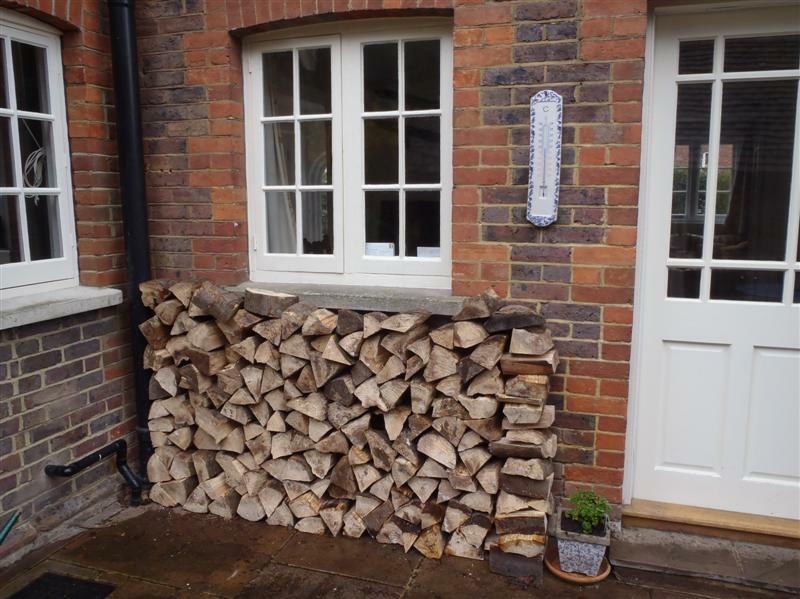 The pile does not necessarily need to be under cover – only the top layer gets wet or snowy – and if you leave any bark facing the elements, this is minimised. 8. 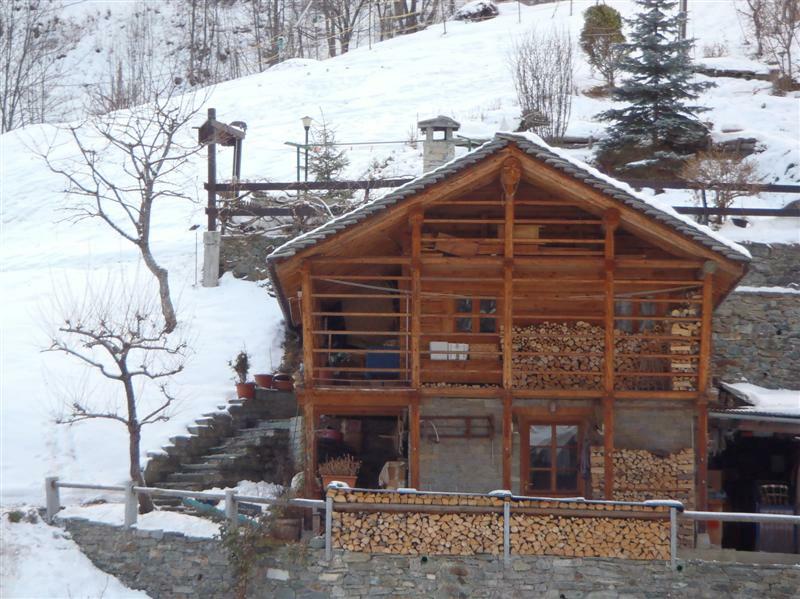 But most piles are next to a building with an overhang, such as most chalets have. In fact, it looks like many houses have been designed with a wood pile in mind. 9. The logs are usually very easily accessible from the dwelling. 10. Many households have a second, messier, pile of unsplit/chopped or partly split/chopped logs, which are being seasoned. 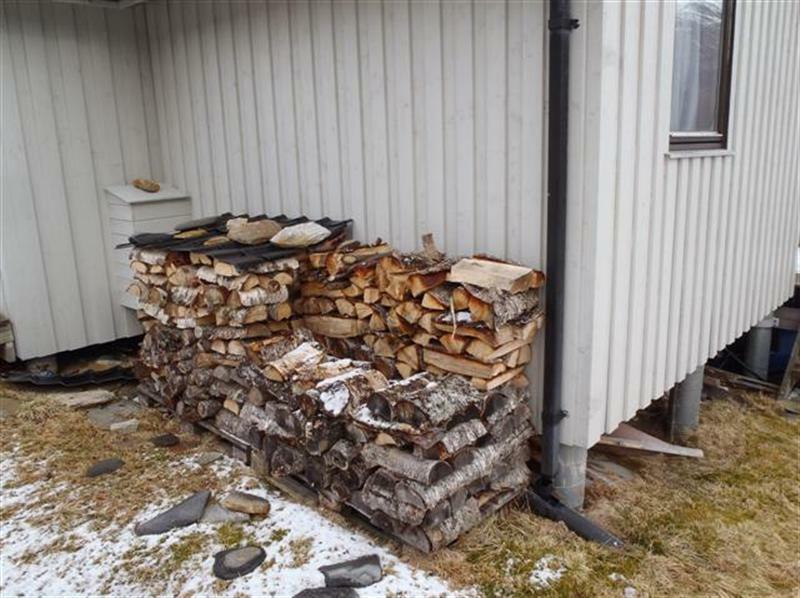 My dad has always kept a very organised, well-seasoned wood pile, and my parents installed a wood stove long before they became fashionable – which is probably partly why I started noticing other people’s ones. 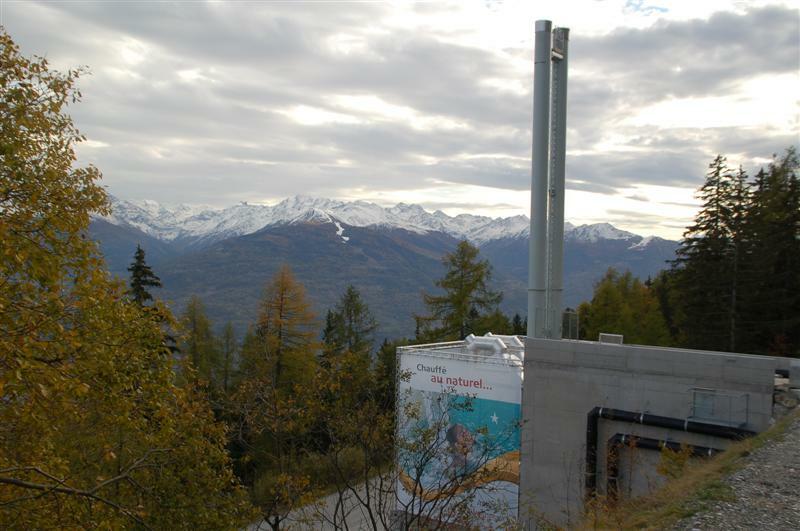 And the village where I’ve done most of my skiing – Anzere, in Switzerland – now has a giant log-burner heating virtually the whole village (read about it in my Telegraph article here). I, however, have only recently got the hang of dealing with wood. Or have I? Judge for yourself by looking at the little stack at my back door in Surrey – I know it’s not up to Alpine standards. Peaslake, Surrey. How does it rate? I confess that although I did the stacking, it’s my house-mate, Alex, who has been responsible for the sourcing and splitting. Readers who know me won’t be surprised that I also have a box of easily ignitable material so I don’t have to waste money on smelly, synthetic fire-lighters. As well as newspaper I’ve taken to hoarding loo rolls and egg boxes. My uncle and aunt get their fire roaring – and fragrant – by adding orange peel, dried in a warm oven or on top of a Rayburn or Aga. I’ve tried it, and it works. So I’m ready for winter. Bring round your loo rolls, egg boxes and orange peel, if you like – I can use unlimited amounts. DO you enjoy this BLOG? Then SIGN UP to RECEIVE AN EMAIL each time I post a NEW ONE by clicking on ‘SIGN ME UP’ on the top right of THIS PAGE. 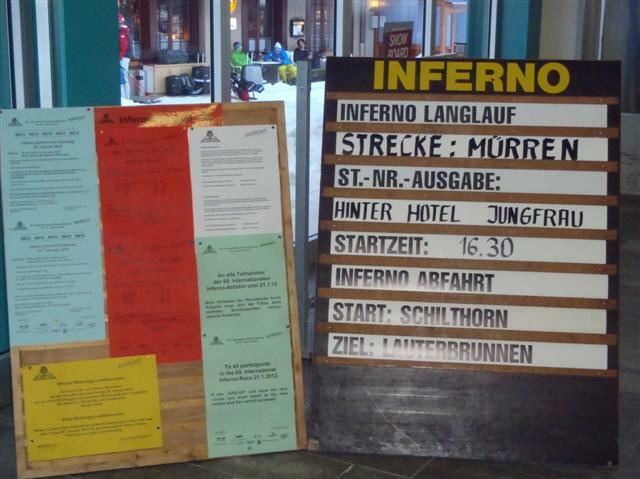 I’m in Muerren, Switzerland, this week for the Inferno ski race. 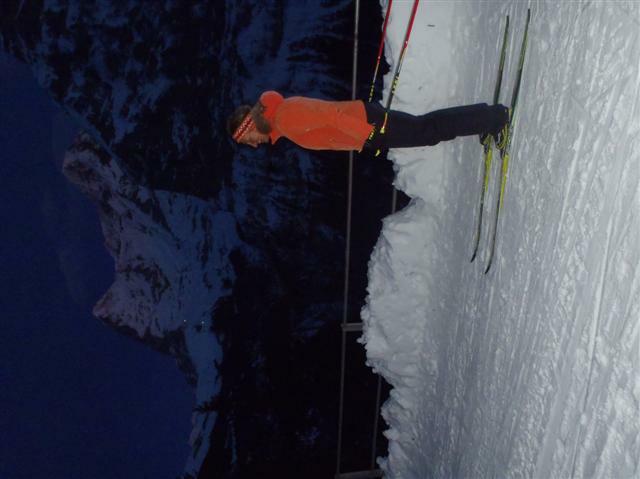 The big news this year is that the full course – from the top of the Schilthorn all the way to Lauterbrunnen (14.9km and 1,990m of vertical) – is skiable and being prepared for Saturday’s downhill. Whether we’ll really be going all that way I’m not sure, as the forecast is for snow Friday and Saturday. In the past, when conditions at the top have been too snowy or windy, it has begun lower down. More pressingly though, right now the langlauf (cross-country) leg of the race – entered by 470 of the 1,850 who do the downhill – is under way as I write. I have a prime viewing spot from the living room at Chalet Fontana, great-value self-catering lodgings in the centre of Muerren. The speed and stability of the early starters is astonishing – a far cry from my own tentative style. There’s hot wine at the “bumps” – designed to make the beginners fall over – and plenty of bystanders shouting “hoya, hiya!” and ringing cowbells to spur racers on. You’ll see from my start number – 315 of 470 – that my record in this race isn’t brilliant. 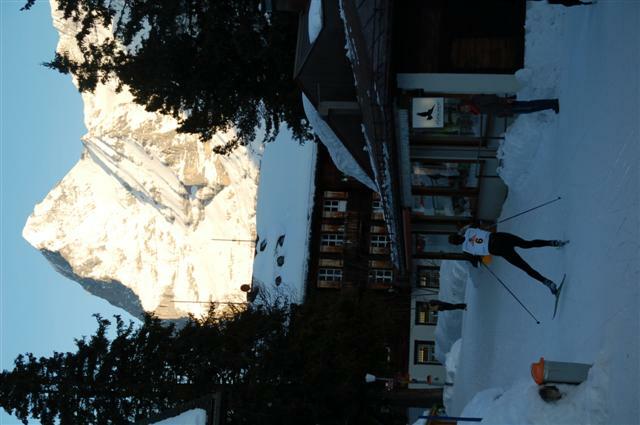 But it’s a fun challenge to do the “combined” Inferno, which also includes a giant slalom, rather than “just” the straight downhill – if only for the relief you feel when the langlauf is over. 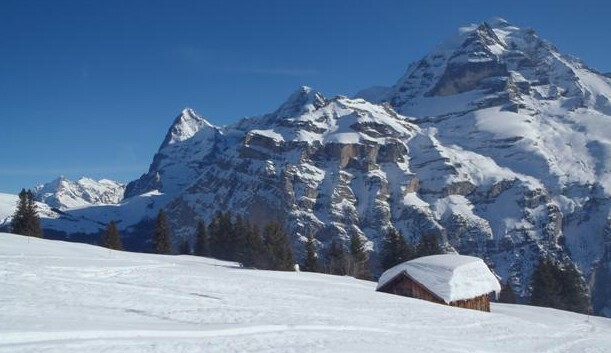 Muerren is looking its beautiful Alpine best this week, with chalet roofs piled high with snow, pistes in wonderful condition and deep blue skies soaring over the Eiger, Moench and Jungfrau summits opposite. You can see by tracks that off-piste conditions have been good lately; however, on many south-east to south-west facing slopes – at all altitudes – there are giant, gaping cracks right down to the ground: a legacy of the 2m of snow that fell all at once within a few days on warm, snowless slopes in mid-December. Some of the cracks have avalanched – some in harmless places, some in more threatening locations. 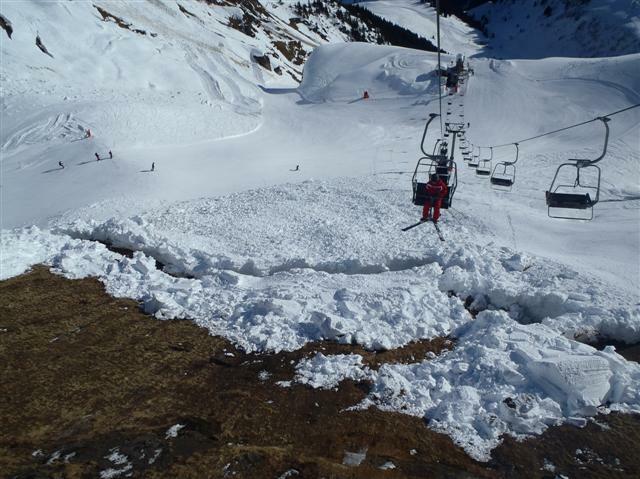 The snow-cats have been working hard to plough several layers of “steps” below such hazardous slab-fields, protecting pistes from the kind of wet-snow avalanches described in a recent “Ezine” I received from Henry’s Avalanche Talk. The cracks really show the sheer quantity of snow here – as does the towering wall of snow, 3m high in places, next to the second long traverse/schuss in the downhill, in the Engetal. Talking of schussing, it’s time for me to gear up with those flippy, lightweight planks for the most knackering part of the week – I’m due to wobble onto course at 6.15pm. Wish me luck! P.P.S. To read about last year’s race, see blogs from January 2011 and to read my article in Country Life about the Inferno 2011 click here. 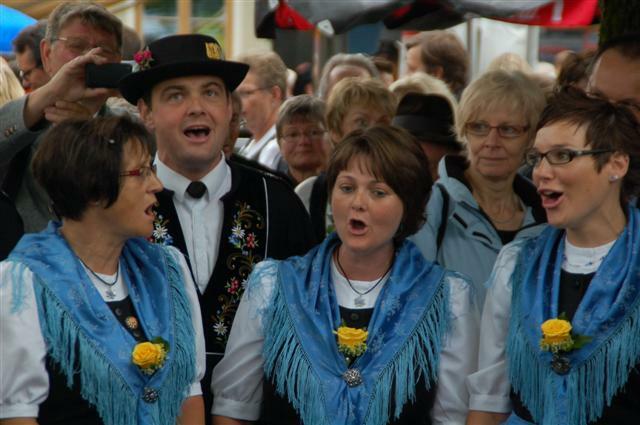 Regular readers of morethanskiing may recall how overexcited I was in June about visiting Switzerland’s biggest yodelling festival – an event that takes place every three years and draws crowds of 200,000 – more than Glastonbury. This excitement turned out to be thoroughly justified: the trip my sister and I took to Interlaken for the festival was one of the best weekend breaks I’ve had – and that includes ski breaks. The Jodlerfest was directly responsible for June’s higher-than-usual blogcount on this site – and now you can read more about it, in the January/February issue of Songlines, the world music magazine. Buy the issue to see it on paper, or click the link below to take you to a pdf of a ‘Postcard from Switzerland’ describing the amazing experience of spending a weekend at the world’s biggest celebration of Swiss mountain music. If, like me, you are one of those people who has one perpetual eye on your next meal, the prospect of the long stretch between breakfast and supper during a hut-to-hut ski tour may seem alarming. What sort of provisions will you pack to sustain you between huts? Will there be room in your rucksack? Will you get terribly hungry? And most worryingly, will your companions’ picnics be nicer than yours? 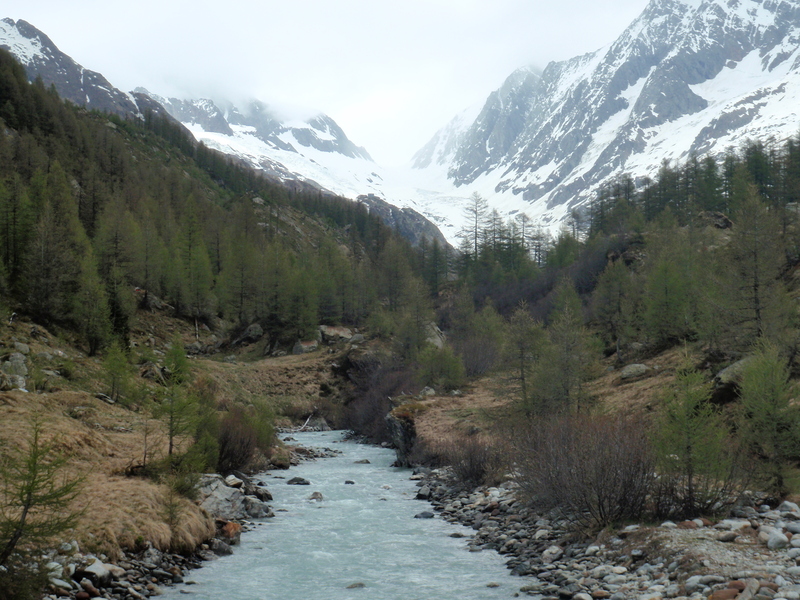 A year ago, when ski touring in the Bernina region, I was the only one to pack ‘energy’-type bars. Nobody wanted to share them with me because they were so unappetising, despite probably ‘doing the job’. 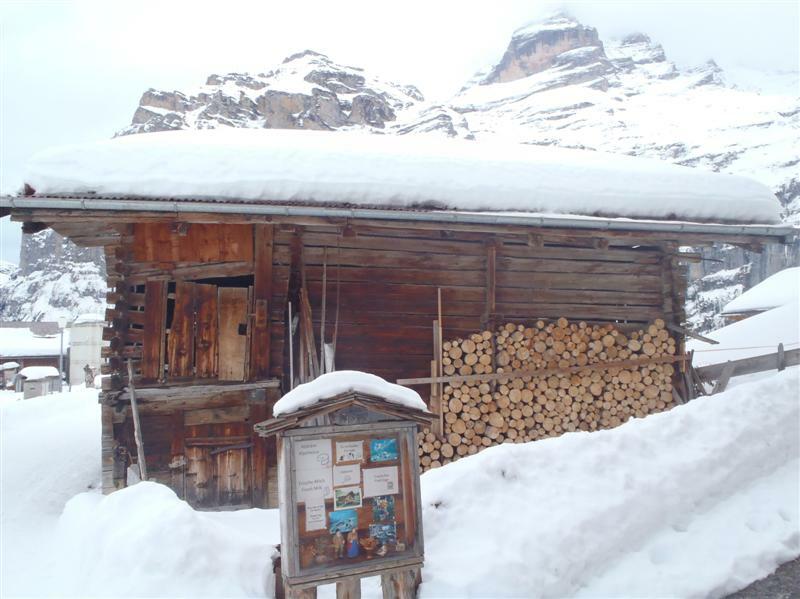 Thankfully most days we arrived at the huts early enough to feast on pasta (on the Italian side) or roesti (on the Swiss side) at about 2pm before sitting down to supper at around 6pm. A much better bet for the rucksack, I have since discovered, are mixed nuts and dried fruit, such as raisins, sultanas and apricots. I buy mine at home from Julian Graves, which seems good value, mix my favourite types together and bring them in a carrier bag. They are delicious and easy to hand around; they provide good energy compared to their weight; they don’t freeze, melt or smell, and unlike individually wrapped energy bars, they aren’t bristling with packaging. A lump of hard cheese is another satisfying snack, which provides a gratifying opportunity to use the Swiss Army knife that weighs down the lid of my rucksack. I like the harder types of Gruyere best, but a word of advice: don’t unwrap it in the dorm room three days into the tour. 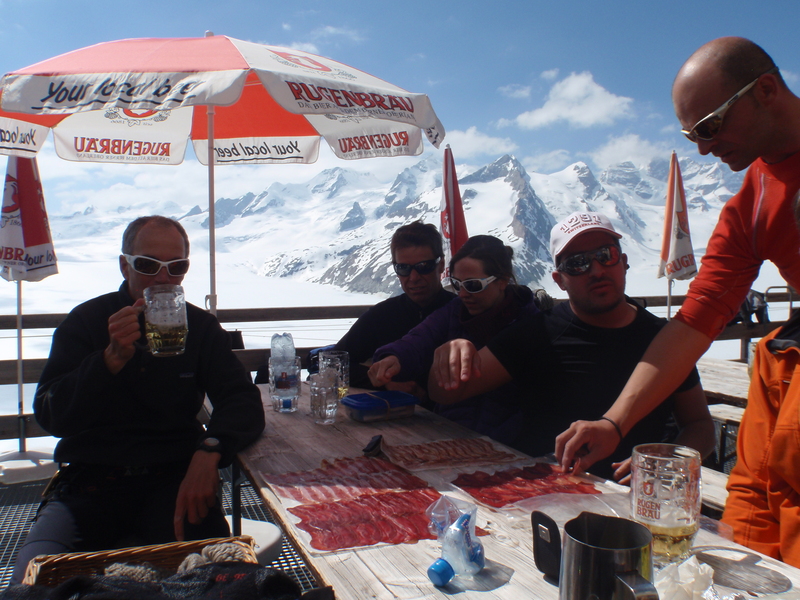 Dried or smoked meat makes tasty Alpine fare, and most mountain guides worth their salt will have a slab of some kind in their rucksack, whether a blotchy, gnarled salami sausage or a slab of smoked ham. One of my favourite mountain meats is the good-value, square-edged Landjaeger, available in bunches of two or four in Austria, Switzerland and probably Germany: the skin is thin enough to eat and you can break off pieces to hand around without the Swiss Army. Wafer-sliced, delicate viande sechee is wonderful too, but you may have to carry packaging to keep it fresh: on a recent Berner Oberland tour, one of my friends, a chef, heroically carried enough for 14 of us to feast on with our afternoon shandy aperos at the Konkordia Hut. And what’s for pudding? Chocolate is the obvious choice, available to buy daily in huts so you can avoid lugging it throughout the tour. But it tends to freeze or thaw, and I find that one bar leaves me wanting a second, whether I’m up a mountain or not. My suggestion is to take sweet/sour shoelace-type confectionary. 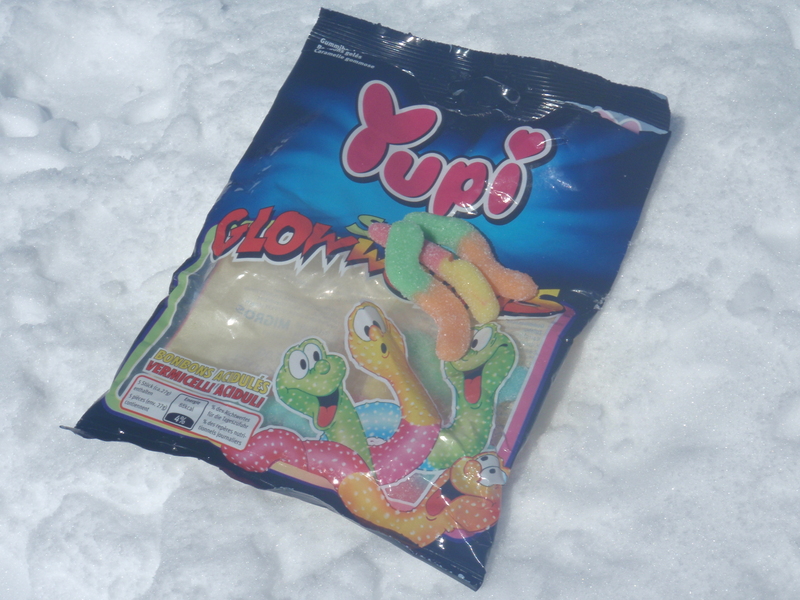 Between Alagna and Zinal in March I carried a bag of Haribo strawberry sherbert-covered ‘snakes’. They were so popular among my companions that I had to ration them towards the end. I took a similar packet, from Migros, to the Berner Oberland, with similar results – though oddly, the boys liked them more than the girls did. 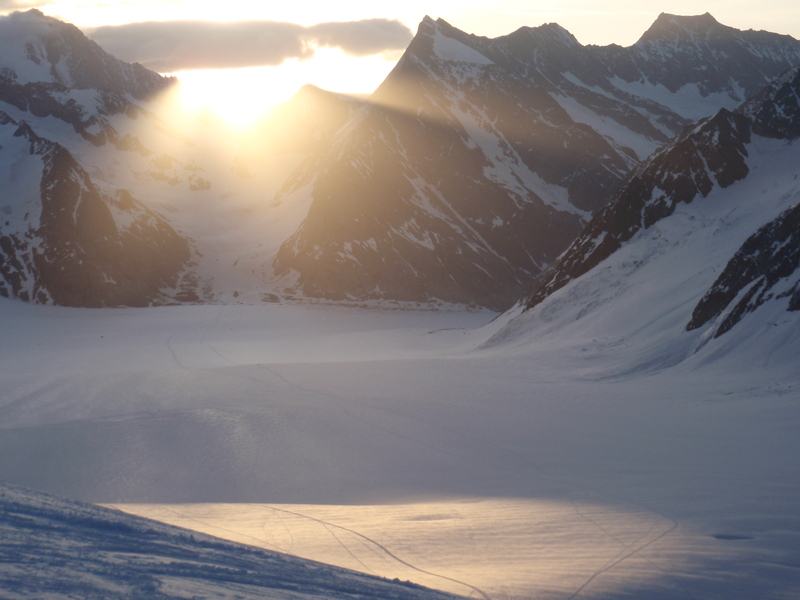 With good reason, the Bernese Oberland is a popular and busy spot for ski touring. Two of the three huts we stayed in were virtually fully booked this weekend, and nearly every slope we skinned up or skiied down was tracked to some extent. But as you can see from these pictures, even when it’s crawling with tourers and climbers in the high mountains, there is no shortage of space. You still only see a dozen other people on each day’s journey. 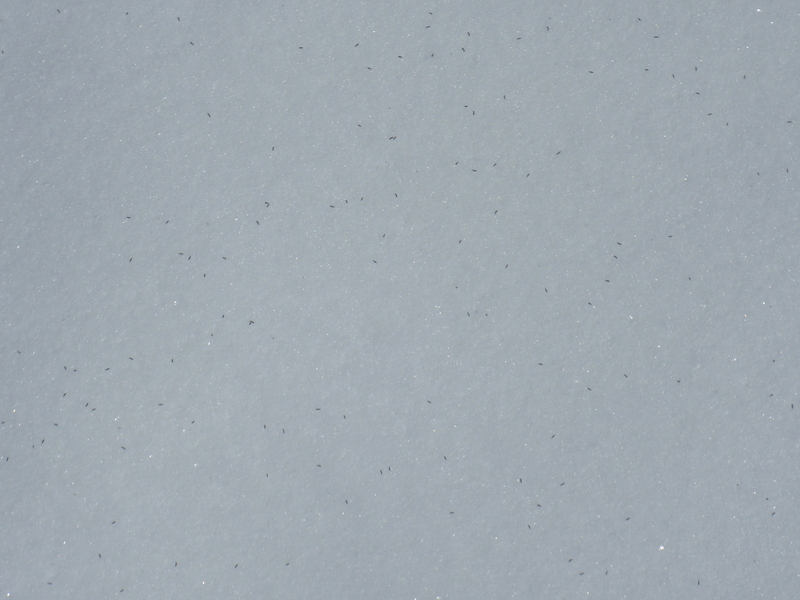 8/5/11 – What are these snow-bound insects? Yesterday morning we were skinning up from the Konkordiaplatz towards the Kransberg, on the way to the Hollandiahuette, our last overnight stop on this four-day Bernese Oberland ski tour. There had been a light wind overnight and the sun was beating down from a clear sky. All over the snow around us were millions – or possibly billions – of tiny insects. At first I thought they were bits of dust. But in fact each speck was squirming. They were spread evenly on the surface, each inhabiting a little space, with few touching another. For more than an hour they were around us: from around 2,900m to 3,300m, when, after a steeper pitch that made me forget to watch them, I realised they were no longer there. I have heard of the Gletscherfloh (glacier flea), but am doubtful that’s what these little specs are. Can anyone identify them? Even though it’s May, I’ve been skiing today. Or rather, walking uphill on skis, and making the occasional downhill slide. 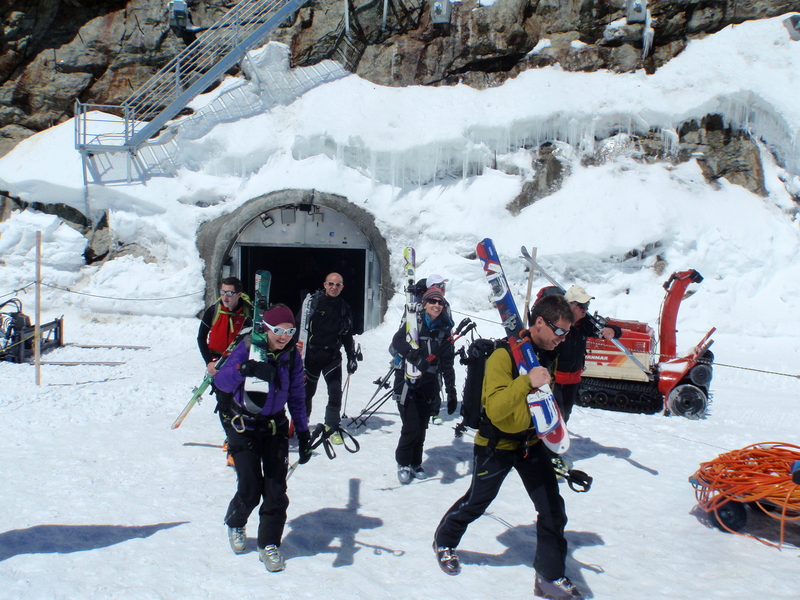 If you’ve read previous posts – such as this https://morethanskiing.wordpress.com/2011/03/23/23311-from-alagna-to-zinal-on-skins/ – you’ll know I love ski touring – an ever more popular activity in the Alps, both among locals and and the likes of Brits. This time, I’m joining a Swiss group assembled by an old Anzere Ski School friend of mine, Caroline Ogi, who now runs the excellent Hotel Walliserhof in Zermatt. Among the group of 12 are a hairdresser, a railway station manager, a chef, a ski shop owner and several colleagues from Switzerland’s very well organised tourist board. 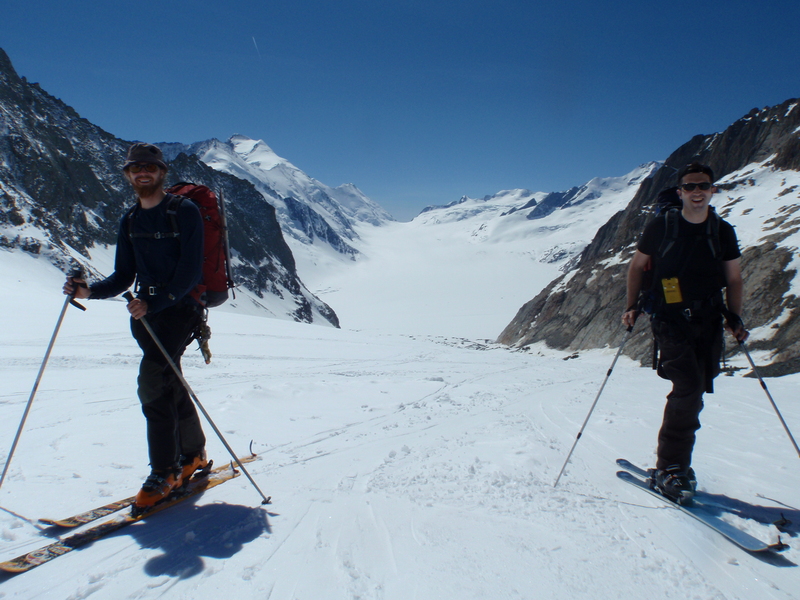 Our mountain guides are Fred, a handsome Valaisan, whose fighting cows are headed for stardom in the upcoming Combats des Reines, and a kindly, bearded, Nendaz-based Belgian who goes by the reassuringly Alpine name of Helmuth. 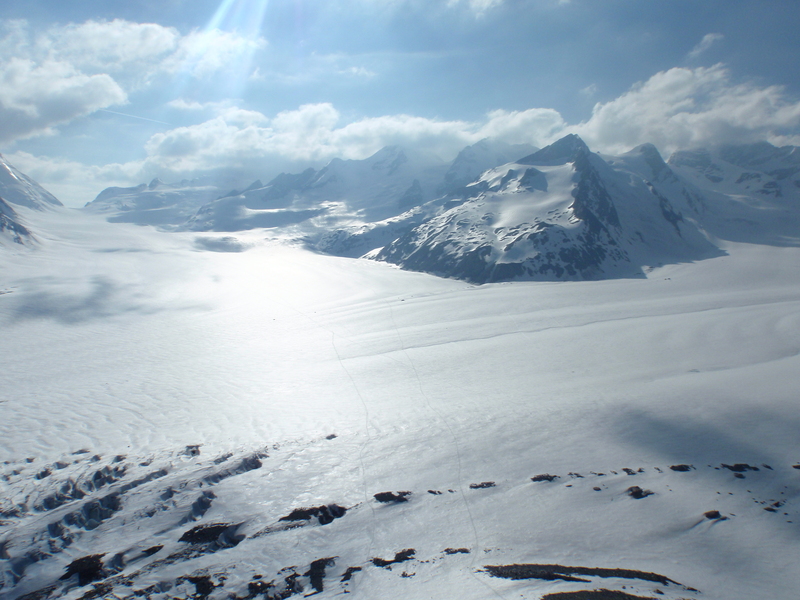 Our destination: the huge glaciers that spread out across the Bernese Oberland, behind the Eiger. Hundreds of Asian tourists accompanied us to our starting point this morning at Europe’s highest railway station, the Jungfraujoch (3,454m). 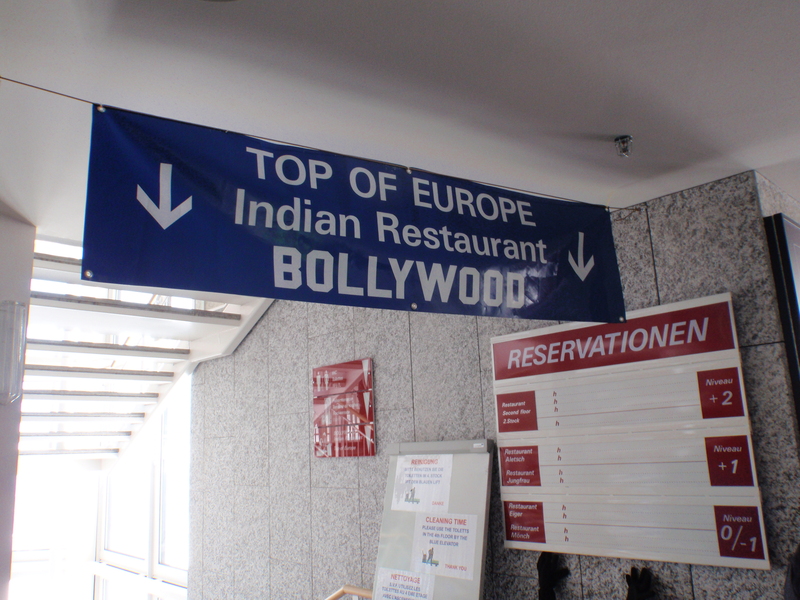 While they made for the Bollywood curry house on the first floor, we skated off down the Jungfrau glacier to the Konkordiaplatz, where the ice beneath the Aletsch glacier is said to be up to 900m deep, then hung a left to climb to the Gruenhornluecke (a col on the way to tonight’s hut). To my surprise, at our picnic break, chat revolved around the Royal Wedding. 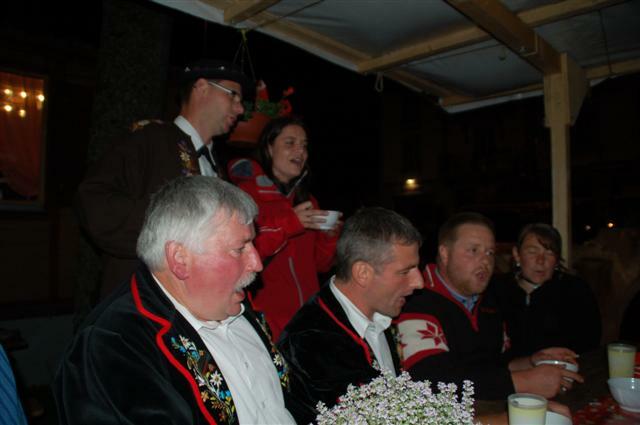 Most of all, the Swissies were interested in “Peeeepah”. 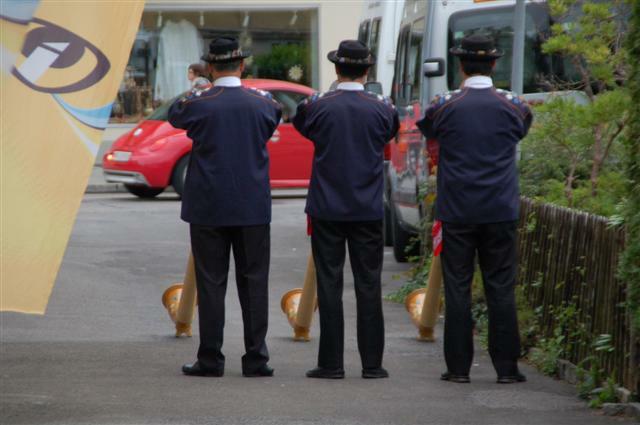 Getting Suisse Romande and Schwyzerduetsch speakers to pronounce Pippa correctly – which was their chief preoccupation – is quite a challenge. Talk was also of the acclaimed Swiss mountain guide Erhard Loretan, who died on his 52nd birthday a week ago. Loretan was one of only four climbers to have summited all the world’s 14 peaks that exceed 8,000m. 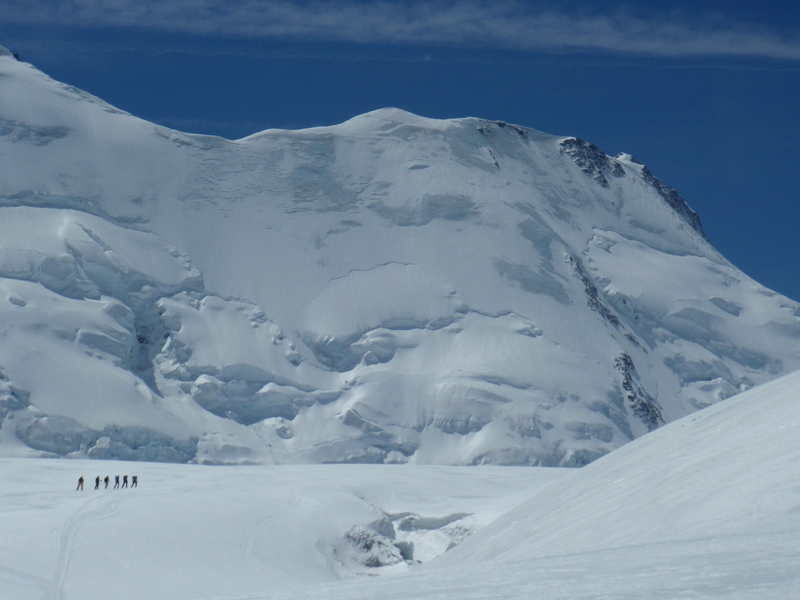 This afternoon we passed the Gruenhorn (which is just over 4,000m), where he fell while leading a client a week ago (read his obituary here http://www.telegraph.co.uk/news/obituaries/sport-obituaries/8484065/Erhard-Loretan.html). 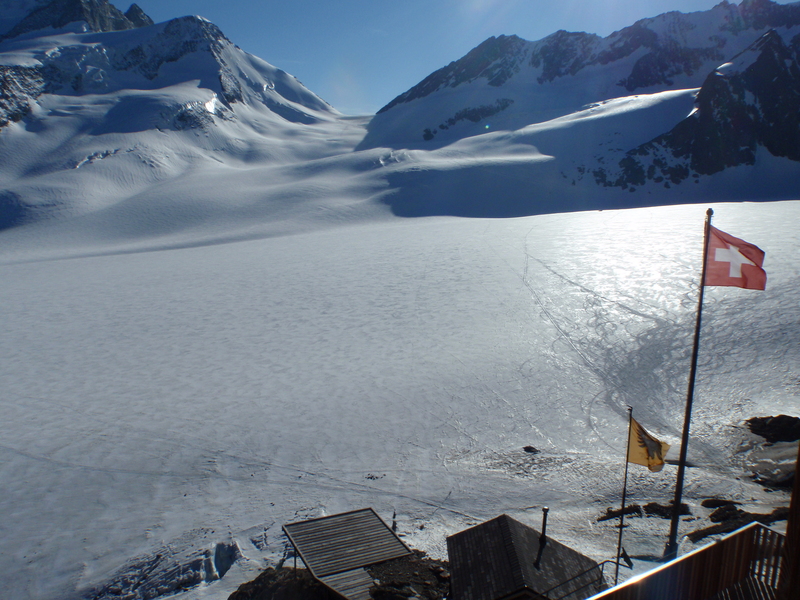 The Finsteraarhornhuette, which we reached at 5pm, has large individual bunks, impressive indoor loos and sensational views from its terrace. No wonder 98 of its 106 beds are taken tonight. Loretan stayed here the night before his fall: I hope the last night of his amazing life was a peaceful and comfy one. 14/2/12 – At last! I am in a movie!